I hope Batman vs Two-Face is good. It'd be a pity if his last work was a blemish on his legacy. I think his legacy is secured even if that movie wound up being the Room of comic book movies. That's so sad, he was a welcome part of many people's childhoods. Very sad news. What else can we say but; "Farewell, Old Chum". My condolences to his friends and families. Very sad to hear. West was a talented "comically serious" actor as Batman and a great sport voicing over-the-top self-parodies on The Simpsons and Family Guy. Thank you and rest in peace, Mr. West. and yes he will be missed. Also on Fairly Odd Parents, where he played, depending on the episode, and which character you ask, either Catman, or Adam West, the actor who played Catman, and kind of forgot it was a role. "The Grey Ghost Returns" was probably one of my favorite episodes of BTAS. Recognizing West's voice and that entire story was a sweet homage. It was so clear that he was having the time of his life as Batman, and I think it's nice that he was recognised in his life as an important and beloved figure in the comic book community. I'm quite sad to hear of his passing, but I like to think he'd be happy with how much joy he brought people in his life. 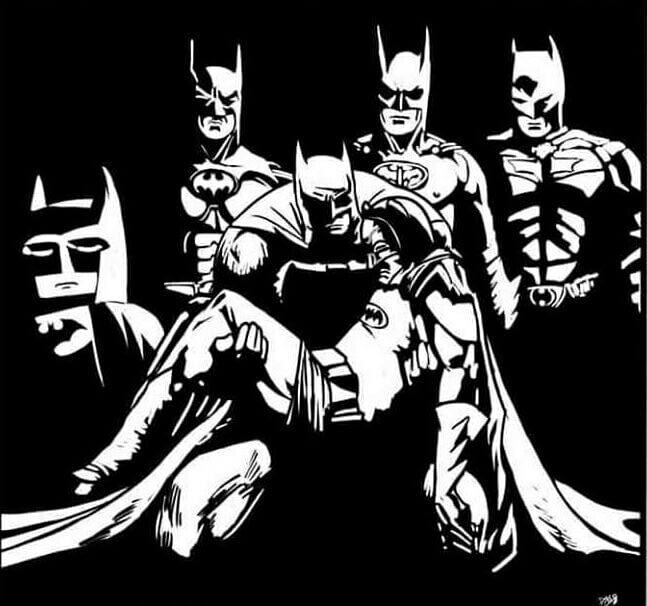 This is a tough one to process, he's been part of how I perceive Batman for as along as I've been alive, and he kept on doing it, either in his Grey Ghost came in BTAS, or being Thomas Wayne in "Brave and the Bold". I hope the Batman 66 Two-Face animated movie was completed because that would be, I think, a fitting finale. It hit me earlier but it's hitting me even harder now, after scrolling through page after page of tributes on Facebook and Tumblr. I hope he realised how important he was to so many people and how much joy he brought. He was a formative part of many of our childhoods and made Batman who he was. His work will always be appreciated. Woke to the sad news this morning. Adam West is the only Batman to span all generations of my family. To my daughter, he was "Shark Repellent Batman" and the voice of the gentle bat-robot in Batman: The Brave and the Bold. To my wife, he was the Grey Ghost in Batman: The Animated Series. To my parents he *was* Batman, the Bright Knight in all his biff-pow-zap technicolour glory. I shared all of those experiences, yes, but to me he's the Batman of Super Powers Team: Galactic Guardians and, most especially, the episode called "The Fear". 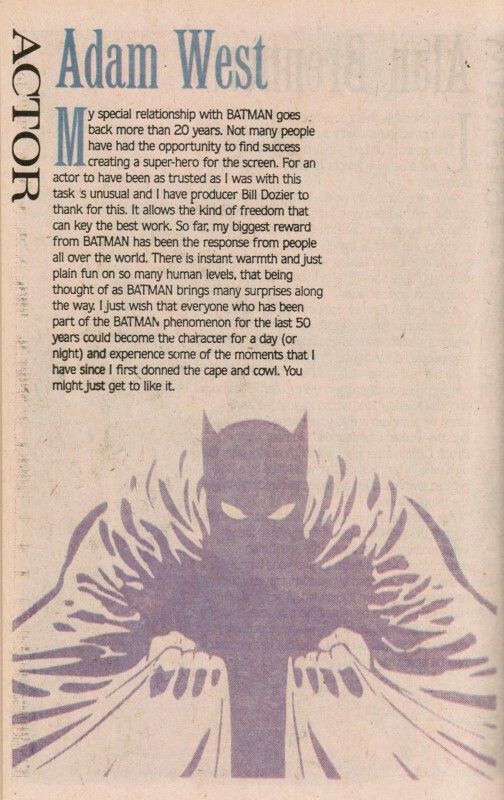 Designed as a back-door pilot for what would later become B: TAS, the ep was the first-ever televised version of Batman's origin (a heady thing for 1984) and West's perforce was a tour-de-force. It helped cement Bronze Age Batman as *my* Batman and showed West's ownership of the role, even shorn of camp and humour. I love it to this day and, if you've not seen it, I'd encourage you to seek it out (it's online at some of the video sites, as well as on DVD). I'm thankful for all Mr West gave all of us. A gifted man, who had given decades to his craft. A man who made us smile, made us laugh, and who made days seem a bit brighter in the works he was associated with. Whether as the caricature of himself on Family Guy, his brief but memorable foray as Simon Trent/the Gray Ghost in BTAS, or his most iconic role as the Bright Knight in the 60's Batman TV show, Mr. West became beloved by his work. I first came across him with Family Guy, which in turn led me to the BTAS episode. And only recently did I have the opportunity and honor of watching the '66 Batman series through a classic TV channel. Tie that in with his cameos in LEGO Batman 3 (including a wonderful level recreating the zaniness of the 60's show), and he left quite a mark on me in recent memory. And deep down, I know that although Mr. West may be gone, his legacy will not be forgotten. I read somewhere that so many actors wanted to be on Batman '66 because "it was taking Alice in Wonderland and playing it as seriously as Hamlet." Not sure who said that, though. The man died peacefully surrounded by family, I think that's the best we can hope for. And at a fairly advanced age. Amen. His parents are dead and he's still pissed off. An old enemy returns. Confronting the Riddler, and we see the problem with casting this villain for future movies. How the hell do you top Frank Gorshin shifting from cool and calculated to manic psycho?